Caught this on TV last night and had to watch it - again. It is still an extremely powerful film with great acting. Is this a war movie that shows the setting from which a group of friends go off to to do their duty or is this a film about community, brotherhood, sacrifice and making meaning, part of which happens to involve a war? I think it is the latter. This is a film of stark contrasts as the story oscillates between compassion and cynicism. The monotony of life centred on working at the steel mill in small town Pennsylvania. The desaturated greyness of the drab and uninspiring townscape of Clairton jars against the kaleidoscopic technicolour grandeur of the orthodox church interior and the lushness of the tropical jungles of Vietnam (shot in Thailand). This film started shooting only two years after the end of the Vietnam war. It's visceral rawness powerfully portrays the contradictions that resonate throughout the story. 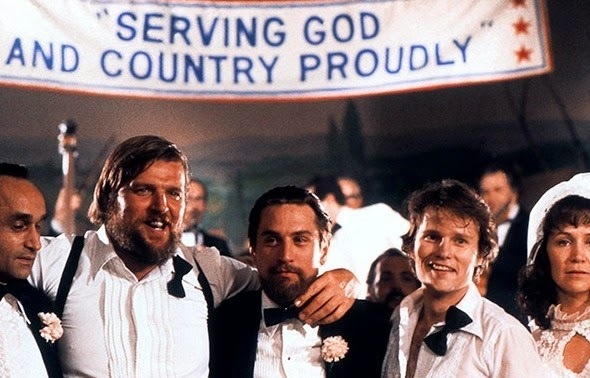 The three characters at the centre of the story Mike (Robert de Niro), Nick (Christopher Walken) and Stevie (John Savage) are joined by friends and family to celebrate Stevie's wedding to Angela (Rutanya Alda). After the celebrations the three are joined by some more friends as they head into the mountains for a final hunting trip before enlisting. There are tensions between some of the characters with Mike always seeming to be the wise one who is in control and to whom everyone turns when they are in any kind of difficulty. In an often quoted speech, Mike says "You have to think about one shot. One shot is what it's all about. A deer's gotta be taken with one shot. I try to tell people that but they don't listen". This establishes the premise that one shot is significant and that with just one shot, a life can be taken - whether that be a deer or a closest friend. Mike bags a deer with a single shot - a majestic stag whose dying is shown in graphic close-up, although it is apparently only the effects of being shot with a tranquilliser - a deep irony given the violence and killing of humans that permeates the film! The most controversial element of the film is the depiction of the North Vietnamese soldiers forcing their American captives to play Russian roulette while they bet on the outcome for their own amusement. There is apparently no evidence that this practice ever took place - but again it reinforces the concept of the importance of one shot and gives the audience further reason to hate the North Vietnamese. Mike's love for Nick and Stevie and his sacrificial attempts to save them both only add to his and the collective film's sense of guilt and hopelessness. When Mike sees the home-coming celebrations that have been planned for him he tells the cabbie to drive on by - so changed is he by his experiences that he cannot face his friends. A scene that echoes with the earlier encounter at the wedding celebration with a Green Beret home on leave. Stevie - now a triple amputee cannot face returning home either and Nick only makes it in a coffin. As Mike and the group head into the mountains for another hunting trip, Mike lines up a deer in his sights only to pull up as he squeezes the trigger - 'just one shot'. The closing scene is set with the group of friends in the bar holding their own wake after Nick's burial. John (George Dzundza) fights back his own tears of grief by starting to sing 'God bless America' and the rest of the group join in. This is an ambiguous ending to the film which throughout always avoids sliding into being patronising. With all that they have suffered and with America's ignominious defeat is that really their sentiment - or is the fact that their rendition of the song is so restrained and low key, a recognition that America really does need God's blessing? The twin themes of compassion and cynicism perfectly entwined. The film is also noteworthy as this is Meryl Streep's first 'big' film (although a small role) and sadly John Cazale's last film as he was terminally ill with cancer as it was made and died shortly afterwards - never seeing the finished film. It won five Oscars - including Walken as best supporting actor. The haunting theme tune resonates so effectively with the story - another component that contributes to this being a top film. I'm surprised that IMDb only ranks it a 62 in the greatest 100 films and it doesn't even make the top 100 on Rotten Tomatoes - which surprises me. If I were to be critical of the film I would say it's viewpoint is very one-sided. It is also a very long film at just over three hours - but that didn't register as I watched it for the umpteenth time. For me it's worth a 9/10. I loved reading this post about your thoughts on the movie. I just saw the movie for the first time...and I took my time watching it as it's a long movie, but a hard movie all in the same. Thank you for sharing your thoughts on this. I always like to see what others see and what they understand a movie to be. Great piece. Keep up the awesome work I will deff be reading more of your stuff. Many thanks Strong Within - appreciated.